A grandfather was shot and killed after he opened fire on police officers who he mistook as home intruders. The man's wife and a responding officer were also injured. The couple's daughter is speaking out as the investigation continues. A Philadelphia grandfather mistook SWAT officers for home intruders and opened fire on police as they entered his home Monday morning to serve a search warrant for the man's grandson, the city's police commissioner said. The confusion led to a shootout that ended with three people shot, police said. The homeowner was ultimately killed, his wife hurt and a veteran officer was left with a bullet lodged in his jaw. "The simplest way to put this is this is an all-out absolute tragedy," Philadelphia Police Commissioner Richard Ross said during a Monday afternoon news conference. The ordeal began around 6 a.m. at a home along the 4800 block of Knox Street. Police were serving a search warrant for a 20-year-old man wanted on a weapons violation. He is the grandson of the homeowner, police said. The search stemmed from a social media post allegedly showing the man with a handgun, investigators said. The arriving officers knocked on the door of the home and announced their presence at least three times indicating they had a warrant, Ross said. They entered the front door into a vestibule and were about to enter the home when the homeowner, identified as 59-year-old Ricardo Giddings, fired four shots, police said. The officers returned fire, striking Giddings in the chest and legs. Investigators say Giddings fired four rounds while officers fired five. Ross said police later learned through interviews that Giddings didn't understand that police were entering his home. "He went about the business of protecting his home not knowing it was the police at the door that he was firing upon," Ross said. Ross said it's likely Giddings didn't hear the officers announce that they were serving a warrant because the television was on at the time. "Neighbors said they heard it but apparently he [the homeowner] didn't hear it," Ross said. Prior to the shooting, the homeowner told his wife, 67-year-old Joann Giddings, to flee from the house, police said. A ricocheted pellet round from a shotgun fired by police struck her in the abdomen. Joann Giddings, who Ross said is the mother-in-law of a city police officer, also suffered back injuries after she fell while fleeing a second-floor window. "We aren't dealing with a bunch of criminals firing on police," Ross said. "It touches us in a lot of different ways." Joann Giddings was listed in stable condition at Albert Einstein Medical Center. The couple's daughter, LaQuisha Johnson, told NBC10 she wants answers. "We want to figure out what went wrong here," Johnson said. "My dad is dead and my mom is in the hospital and fighting for her life." One of the responding officers, 49-year-old Jaison Potts, was hit in the face by a bullet during the shootout. A 20-year veteran of the force, Potts was rushed to Temple University Hospital where he was listed in critical condition. Ross said Potts, despite bleeding heavily, was able to walk into the emergency room on his own. "We do believe that he is going to survive despite the critical nature of his injuries," Ross said. "He's got a ways to go." Potts, who suffered "very serious" facial injuries, including a broken jaw, will undergo surgery on Tuesday. Ross called Potts a "very tough guy." The bullet stopped near Potts' ear and remains lodged in his jaw. Potts attended Cheltenham High School in neighboring Montgomery County and is a married father of three. His family was by his side at the hospital, Ross said. Ross said it is not common for SWAT team officers to open fire during assignments. "These high risk warrants are just that. They're high risk for obvious reasons," Ross said. "SWAT serves approximately 300 of them every year without incident." The last time a member of the SWAT team was engaged in a shootout was in 2015 while serving a warrant and the officer was hit on his bulletproof vest. "It's very rare because of the manner that they do their surveillance of the properties as well as their entries that they are even compelled to discharge their weapons," Ross said. Potts was supposed to start vacation at the end of the day, Mayor Jim Kenney said. The veteran officer instead spent his day sedated while undergoing tests at the hospital. Police say the 20-year-old man who they were initially looking for later turned himself in and was questioned. He was later released however and no charges were filed. Police only found a weapon belonging to Ricardo Giddings during the search. Correction: Police said during a press conference that the woman injured is 67-years-old. 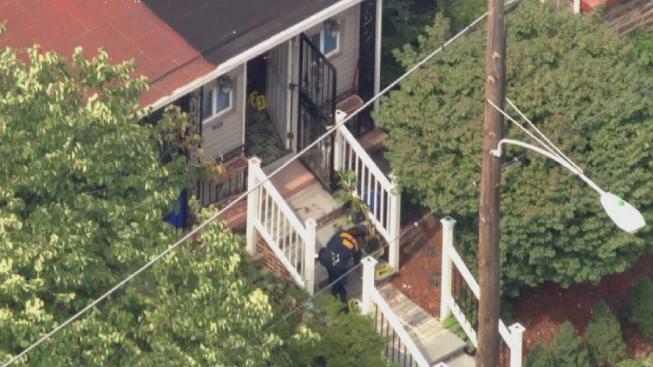 NBC10 confirmed with family members and records that the woman is 59. Correction: This story has been updated to reflect the spelling of Officer Jaison Potts' first name.